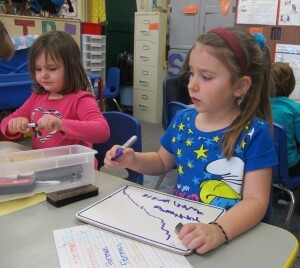 A Head Start student at Eastview Elementary in Connersville draws on a white board. Indiana Head Start classrooms remain open even as hundreds of others across the country close their doors because of the government shutdown. About 19,000 students attend early childhood education classrooms that were supposed to receive their federal funding for the year on Oct 1. But because of the government shutdown, none of those programs got that money on Tuesday. “We do not have any October 1 grantees, so they are okay so far,” writes Indiana Head Start Association President Cheryl Miller in an email to StateImpact. In other states, the situation is more dire. While Massachusetts has pledged state dollars to keep those centers open, Head Starts programs in nine other states are having to dip into reserve funds or close down without cash on hand. Indiana is one of 10 states that doesn’t provide any public money for preschool on the state level. So for many of the 15,000 low-income kids who attend Head Start classes in Indiana, the federally-funded program is the only option. The state had to cut about 700 spots because of sequestration, though there continue to be long waiting lists in many communities. ← Friday Doodle: Which Of These Indiana School Districts Could Pair Up?